Did you know that stress can cause illness? What about migraines, headaches, stomach aches, hair loss, and insomnia? Stress can eat away at our bodies if we aren’t careful. If that big case at work is causing you to eat more than usual, you can chalk it up to stress. If staring at the computer screen at work is making you have tension headaches – or worse – then it’s probably a sign that you’re stressed out and working too hard. Stress can manifest itself in a variety of ways, but what can you do to fight stress? How can you deal with the daily nuisances that seem to eat away at you? If you’re interested in getting rid of those pulsating tension headaches, eliminating digestive issues, and ensuring you don’t pack on the pounds from overeating, then it’s time you take your stress into your own hands and learn how to combat it. How can you combat stress and illness? Well, it’s simple! 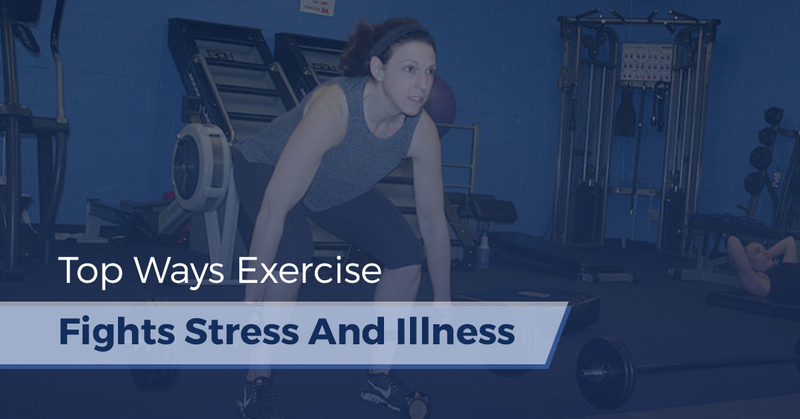 Exercise will help you fight stress and illness. Fortunately, at B.O.S.S. Fitness we’re able to show you the top ways that exercise can fight stress and illness. When you exercise, what do you like to do? How does it make you feel? Do you feel better or worse after you run a few miles or lift some weights? Exercise can be done in a variety of different ways. There are tons of fitness classes available to take, especially at B.O.S.S. Fitness. If you hate working out by yourself, then fitness classes are probably your answer to getting in shape. You can also exercise by yourself or hire a personal trainer, all at B.O.S.S Fitness. Exercise will make you feel better and you’ll notice you aren’t as stressed or anxious as you were before. It might seem easier to take on using supplements or other shortcuts to lose weight, but in the long run, you’ll feel better when you exercise and you’ll look great. If you’ve been dealing with stress and illness in your life, then it’s time you combat it with exercise. Sitting in a chair at a desk day-after-day will result in a few episodes of frustration. Your computer isn’t doing what you want it to. Your boss tells you off for things you can’t control. That project you’ve been slaving over night and day isn’t what the client asked for, so you get frustrated. Life comes with frustration and the easiest way to really let all of those frustrations go – before you blow a gasket – is to exercise. Exercise is one of the best ways to eliminate bad moods. When you get frustrated, you probably vent to your coworkers, best friend, spouse, or even online, but you’re still holding it in. You have this pent up aggravation eating away at you and you just let it sit there. Exercise will give you the opportunity to let it out. With kickboxing fitness classes, running, step fit classes, or kettlebell fitness classes, you’ll be able to work off that frustration without having an episode. Let your frustration out and you’ll realize how much less stressed you feel. Stress can be caused by disorganization, dissatisfaction with your social or love life, lack of self-confidence and many other factors. Exercise can change all of that around. So if you feel like you don’t have any good friends, when you join a gym or fitness class you’ll be able to make some great friends. When you begin to join fitness classes or make time to stop at B.O.S.S. Fitness, you’ll need to start organizing your time better to prioritize exercise. If you feel like you have no self-confidence, then working out will boost your endorphins, tone muscle, and give you the confidence you need. Exercise can be attributed to a lot, from managing cardiovascular issues all the way to giving you a community of people who like the things you do. These are only three top ways exercise can eliminate stress and illness, continue reading our blog to learn a few more ways you can deal with the curveballs life throws at you with healthy living.